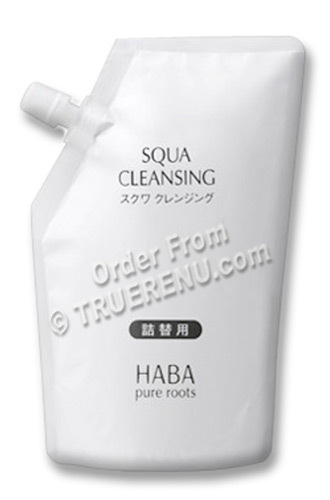 Economical Refill size of HABA's Squa Cleansing Oil, a gentle yet effective make-up remover and cleanser all in one. It easily removes even the heaviest make-up while keeping the skin moisturized and healthy. All the rage in Japan...! HABA's new "pure roots" skin care product line contains no parabens, flavors, mineral oils, synthesized tar colorings or petrochemical surfactants that can irritate the skin. Contains squalane, a purified and intense antioxidant found in shark liver oil and in our skin, keeping it moist and resilient. After age 25, our ability to produce it decreases. Japanese squalane from HABA replenishes without additives, and due to its high oleic acid content it is extremely well absorbed by your skin. Removes makeup and dirt, deep cleans and moisturizes in one step. Olive oil helps cleanse and leaves skin feeling moist, with no oily residue. HABA Oil Cleansing is a superb makeup removing cleanser as well as a moisturizing cleanser for use with or without makeup. If you'd like to learn more about HABA, try one of the products - and toss our 10-Product Trial/Sample Set (item 4904) in your shopping cart for a luxurious way to sample many of their most popular products. Unscrew cap on built-in pour spout and refill your bottle. To remove eye makeup and lipstick put oil on a cotton ball and gently wipe off. To cleanse entire face, apply to dry hands and massage into dry skin. Rinse with warm water - cleanser will turn white and then clear as all impurities are removed. Ingredients: Cetyl ethylhexanoate, squalane, ethylhexyl palmitate, PEG-20 glyceryl triisosotearate, polyglyceryl-10 pentaisostearate, polyglyceryl-6 isostearate, dextrin, palmitate / ethylexanoate, glyceryl tribahenate / isostearate / eicosandioate, lithospermum officinale root extract, hibiscus sabdariffa flower extract, butylene glycol, water. Product Size: Net Volume: 240ml refill pouch, or about 8.1 US fl oz.